The Navodaya Vidyalaya Samiti has invited the candidates through online recruitment application form for the latest Jawahar Navodaya Vidyalaya Recruitment 2016. The officials disclosed the total number of vacancies is 2072 including various categories. All the candidates who hold the eligible criteria can apply through the NVS Recruitment Apply Online link available on the official website mecbsegov.in. Jawahar Navodaya Vidyalayas (JNVs) are the system of alternative schools that are run by the Navodaya Vidyalaya Samiti. It was formed in the year 1986 and has its main hub at New Delhi, India. JNVs are the residential and co-educational schools that are affiliated to Central Board of Secondary Education. JNVs exist all over the India, releases the latest notifications every year. The recent employment news announced by the Navodaya Samiti is NVS PGT TGT Notification. 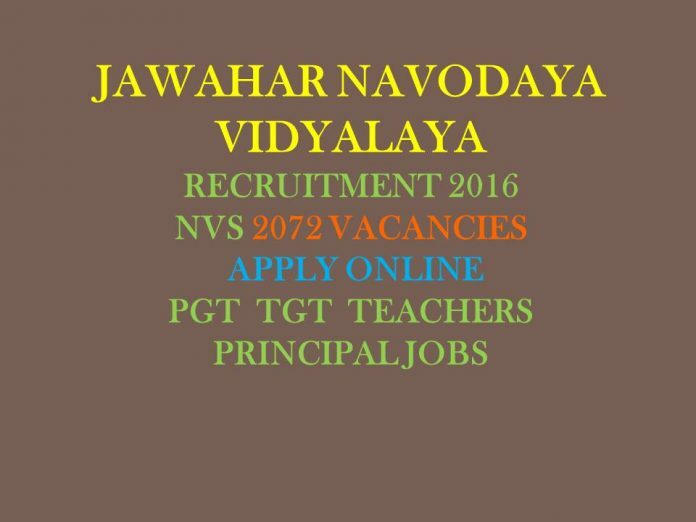 They have released the Jawahar Navodaya Vidyalaya Recruitment 2016 to fill 2072 vacancies for the posts of PGT (Post Graduate Teacher), TGT (Trained Graduate Teacher), Assistant Commissioner, Principals and Miscellaneous Teacher. Candidates who are probing for Navodaya Vidyalaya Samiti Teacher vacancies can grab this opportunity without fail. Before applying, applicants have to check the eligibility details as mentioned by the NVS Recruitment board. Moving to acceptability details, the education qualification of aspirants should have passed Graduation/B.Ed/Masters Degree in relevant subject from any recognised university. Applicants, who are applying for Jawahar Navodaya Vidyalaya Recruitment 2016, should attain the age limit of 35 years to 45 years for Principal posts, not more than 40 years for PGT posts and should not exceed 35 years for TGT, Miscellaneous Teacher & Third Language Teacher posts. The process for filling online recruitment application form is clearly mentioned in the official NVS PGT TGT Notification. Candidates need to visit the official website of the NVS, mecbsegov.in, for NVS Recruitment Apply Online link. Candidates must note that they can apply through online mode only. Any other mode or method of application will not be accepted. The incomplete application form or those who submit the forms after the last date shall be rejected. For more news and updates follow our site Techfactslive.com or visit Facebook page.